It is July 1917. 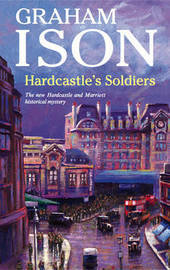 DDI Ernest Hardcastle, head of the CID for the A or Whitehall Division of the Metropolitan Police, and his assistant, Detective Sergeant Charles Marriott, investigate the murder of a cashier operating an army bureau de change at London's Victoria Station. An army officer claims to have seen the murderer running away, but despite giving chase he was unable to catch him. An army cap left behind appears to identify the murderer, and Hardcastle believes that it will be a simple matter to go to Aldershot and arrest him. But things are never as easy as they seem, and soon Hardcastle and Marriott find themselves investigating a frustrating and seemingly unsolvable case. Has Hardcastle finally met his match? During Graham Ison's thirty year career in Scotland Yard's Special Branch he was involved in several espionage cases and the investigation into the escape of the spy George Blake. He also spent four years at 10 Downing Street as Protection Officer to two Prime Ministers.